Pulse the coconut flakes on “chop” on the food processor. Set side in small bowl. Place walnuts, almonds, cocoa nibs in the food processor and “chop”. Move these dry ingredients into a medium to large bowl adding cocoa powder and salt. Set aside. In food processor puree dates, agave nectar and vanilla until it is almost a paste. Add to bowl with dry ingredients. Mix well, using rubber gloves. Roll into balls. It will be a little messy because dough will be sticky. 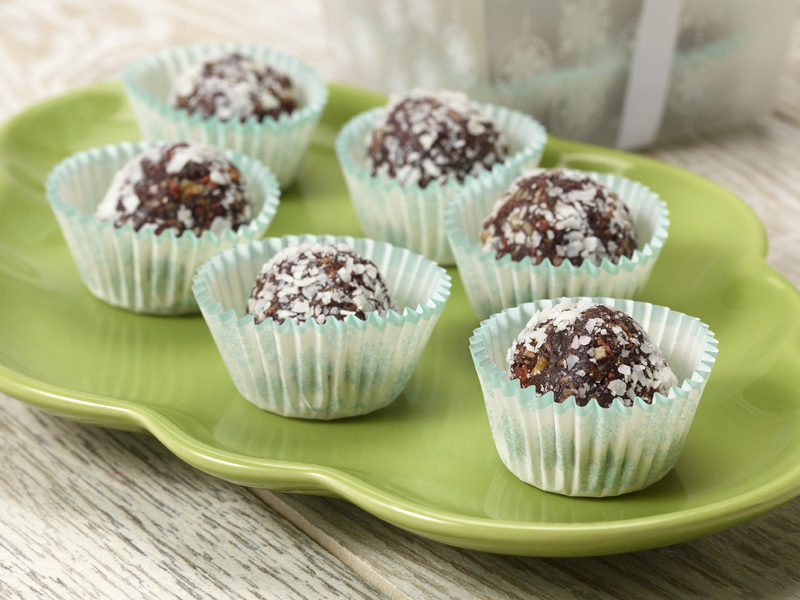 Spread out coconut flakes on a plate or flat surface. Roll the balls in flakes until covered on all sides.